The already historic summer of 2015 ended with a meteorological curveball from Mother Nature, as a season of record heat concluded with a powerful, autumn-like storm. However, perhaps the major pattern change should not have been surprising, since such long-term environmental imbalances sometimes require a rapid course correction to facilitate a shift toward system equilibrium. 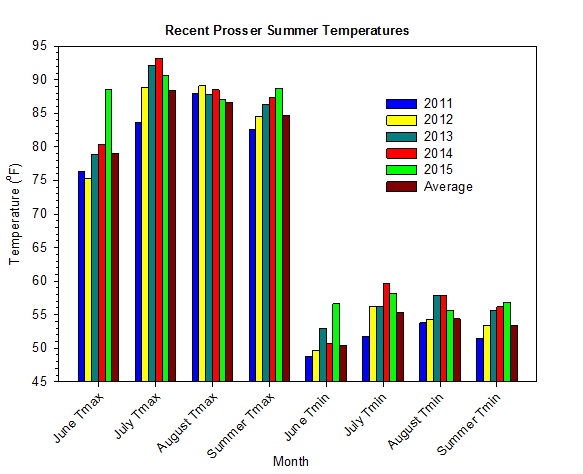 2015 was Prosser's hottest summer ever, as last year's record was shattered by more than one degree. The seasonal mean temperature was 3.7 degrees above normal, which is due mainly to the fact that June was by far the hottest calendar month (relative to normal) on record. June was actually warmer than August in 2015, which is only the second time that this has occurred. On June 28th, PK_McClenny reached a scalding 114 degrees during the second major heat wave of that month. By contrast, August was merely somewhat above normal, and pales in comparison to June and even July. The summer of 2015 is tied for the most above normal season on record, which is rather unusual given that winter tends to be a more variable season from year to year. Overall, the summer was hot, smoky, and dry. Luckily, everything changed on Saturday, August 29th. The potent low pressure system that featured wind, rain, and cooler temperatures was notably strong for any Washington storm, but was especially impressive given the typically inactive and benign time of year, and was even more remarkable given the oppressive monotony of 2015 to that point. The regrettable impacts of the strong wind included power outages, blowing dust, and road closures. However, the merciful rainfall and cooling temperatures were welcomed by firefighters, and the air mass exchange helped to clear the smoke and improve the air quality. A highlight of the storm included Anatone recording a 52.5 mph wind gust, which was their strongest since June 2008, and the strongest recorded at any AgWeatherNet station since May. Meanwhile, Tumwater SW recorded 1.4 inches of rain on August 29th, which was their highest daily total since March 15th, while East Olympia recorded a 15 minute rain value of 0.24 inches. At Pogue Flat (Omak), the high temperature on August 31st of 66.4 degrees was their coolest high (at that time) since May 13th. Despite the radical pattern change and unusually strong summer storm in late August, the headline of the season was certainly the unrelenting and largely unprecedented heat. Very hot weather at the beginning of the month eventually yielded to more seasonal but still warm conditions. High temperatures in central areas began August in the 90s and 100s, before falling into the 80s by August 5th. 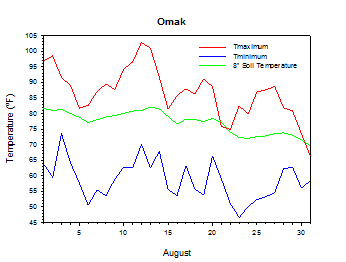 Very warm temperatures returned early in the period, before strong winds and widespread blowing dust arrived on August 14th. Following a brief mid-month cool down, hot weather resumed later in the period. Hot and dry weather for most of the period transitioned to much cooler and unsettled weather during the final 3 or 4 days of August. A potent storm passage on August 29th brought strong winds to Washington, along with locally heavy rain to western areas, while also ushering in a major pattern change. 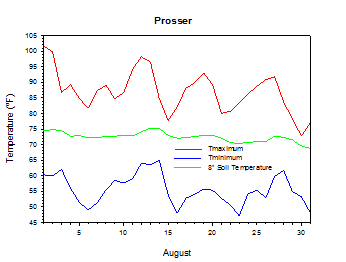 The average August temperature at Prosser (WSU IAREC) was 71.0°F, which is 0.6 degrees above average. The average high temperature was 87.1°F, which is 0.5 degrees above average. The average low temperature was 55.6°F, which is 1.2 degrees above average. The maximum temperature recorded last month was 101.7°F on August 1st, while the coolest daily high was 72.8°F on August 30th. Low temperatures ranged from 65.0°F on August 14th to 47.2°F on August 23rd. Daily average temperatures ranged from 80.5°F on the 12th to 63.2°F on the 30th. The monthly precipitation total was 0 inches. 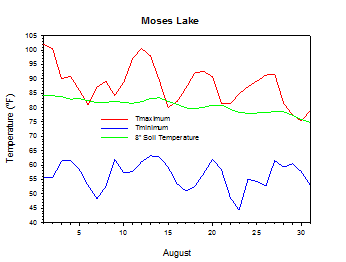 The average wind speed was 4.2 mph, and the average 8 inch soil temperature was 72.5°F. August 1st: The high temperature at Wenatchee rose to 104 degrees. August 7th: The low temperature at Pullman was a chilly 39 degrees. 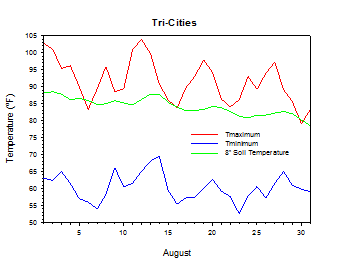 August 12th: The high temperature at the Tri-Cities soared to 104 degrees. August 29th: 1.4 inches of rain fell at Tumwater SW.
August 29th: The wind at Anatone gusted to 53 mph. June was an incredibly warm month. It was by far the hottest calendar month on record, with an unprecedented +8.1 degree departure from normal at Prosser, including +9.6 degrees during the day. Two major heat waves punctuated the scalding temperatures of June. Benton City reached 106 degrees on June 8th, and then PK_McClenny soared to 114 degrees on the 28th. 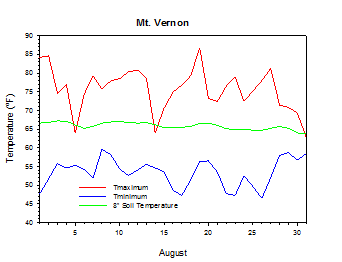 July was another very hot and dry month, as Mt. Vernon experienced their warmest month on record. 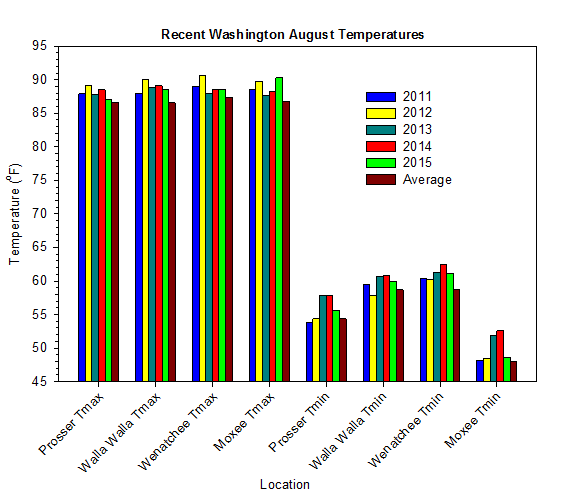 Orondo climbed to 109 degrees on July 3rd, while Wahluke Slope recorded a low of 83 degrees. 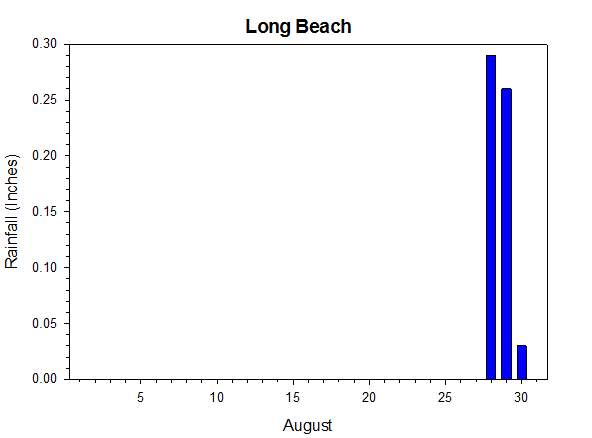 On July 9th, Whitcomb Island concluded a stretch of 14 consecutive days above 100 degrees. 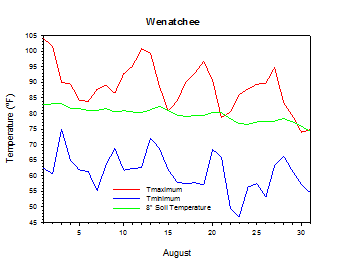 Although temperatures were scorching during the first ten days of the month, the heat subsided a bit for mid-July, and 0.83 inches of rain fell at Anatone on the 11th. The end of July was rather changeable. The temperature at Peshastin peaked at 105 degrees on the 19th. However, a cool storm passage sent the high temperature at Pullman down to 66 degrees on the 27th. 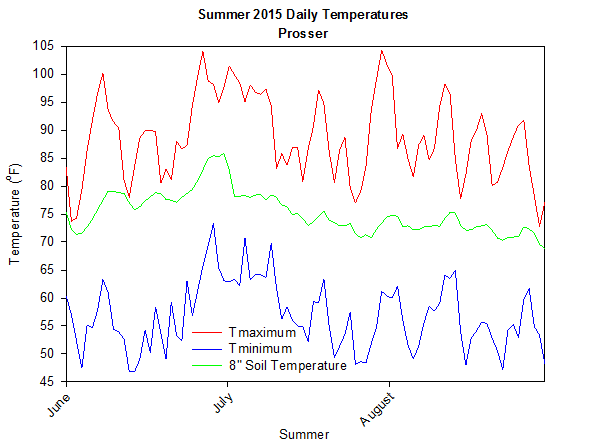 In fact, July 26th was Prosser's coolest day, relative to normal, since January 2nd. By July 31st, the temperature at Benton City had warmed to 108 degrees. 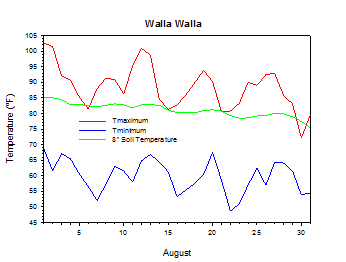 The average summer temperature at Prosser (WSU IAREC) was 73.4°F, which is 3.7 degrees (2.2 standard deviations) above average. The average high temperature was 88.8°F, which is 4.1 degrees (2.0 standard deviations) above average, while the average low temperature was 56.8°F, which is 3.3 degrees (1.9 standard deviations) above average. Daily high temperatures ranged from 104.3°F on July 31st to 72.8°F on August 30th. Low temperatures varied from 73.3°F on June 29th to 46.8°F on June 14th. Daily average temperatures ranged from 87.0°F on June 28th to 63.0°F on June 13th. 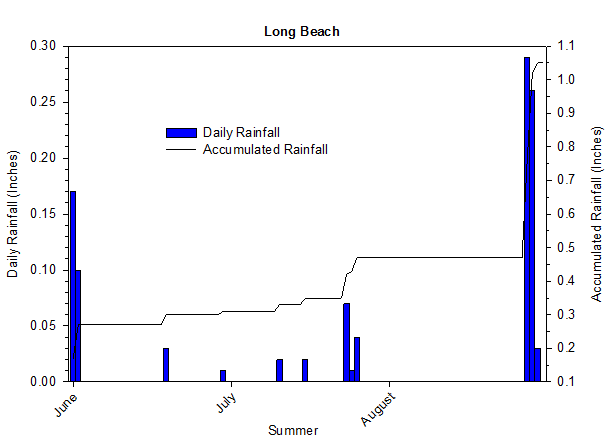 0 inches of rain fell during the summer season. 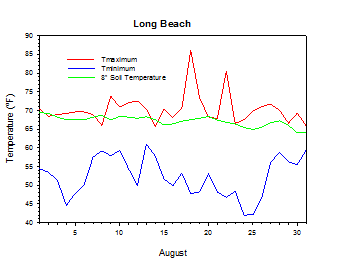 The average wind speed was 4.2 mph, while the average 8 inch soil temperature was 75.3°F. June 8th: The temperature at Benton City climbed to 106 degrees. June 28th: The temperature at PK_McClenny rose to 114 degrees. 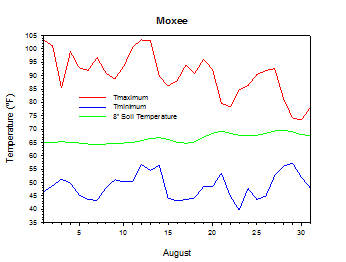 June 28th: The low temperature at Wahluke Slope was a sultry 85 degrees. July 3rd: The temperature at Orondo peaked at 109 degrees. August 14th: The wind at Pullman gusted to 41 mph. June: Very hot and dry. Some wind damage was reported in corn fields in Skagit County as a result of the late August storm. Otherwise, apple, peach, and wine grape harvest continued in August. Most of the month was hot, dry, and smoky (National Agricultural Statistics Service). 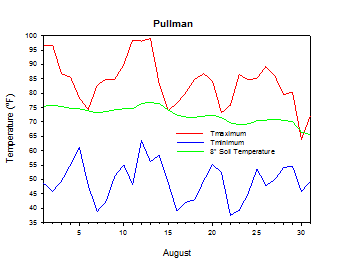 On August 25, 2012, the temperature at Pullman dipped to 32 degrees. According to the Climate Prediction Center (CPC), warmer than normal conditions are likely during the rest of 2015 and well into 2016, while drier than normal weather is somewhat likely for much of the coming autumn and winter. El Niño is currently strong, and is expected to peak, possibly at a record level, in the late autumn or early winter.